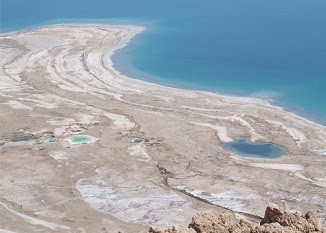 One of the ideas for saving the Dead Sea, whose rapid retreat is visible in this bird's-eye view, is constructing a channel to bring sea water from the Red Sea. HERZLIYA, Israel (JTA) – On aerial photographs, the shrinking Dead Sea juts into the surrounding desert landscape like a blue index finger. As part of the effort to prevent this finger from becoming a mere smudge on the map by 2050, the World Bank is conducting a $14 million study into the practicalities of building a channel to bring water from the Red Sea to the Dead Sea, which is shrinking rapidly due to evaporation and upstream water diversion. Proponents say the plan could rescue the Dead Sea while supplying desalinated water and hydroelectric power to the region. "We will have to balance the technological, environmental and economic issues at the heart of this complex study," Peter Darley, the team leader of the feasibility part of the World Bank study, said at a public hearing last week in Herzliya. Similar public hearings were held earlier in the week in Amman, Jordan, and the West Bank city of Ramallah. The governments of Israel, Jordan and the Palestinian Authority, all of which stand to benefit from such a project, had asked the World Bank to fund and oversee the study on the implications of building a 112-mile long conveyance system -- either a canal or pipeline -- to bring the water to the Dead Sea. The idea has come under intense fire from Israeli environmentalists and water experts, who argue that more time than the year currently allotted needs to be devoted to studying the possible scientific consequences of the project. They cite the potential environmental damages the project could cause, whether it be to the fragile coral reefs of the Red Sea or the unique Dead Sea ecosystem. They say alternatives must be studied in tandem by independent-minded international consultants -- not representatives of the three governments involved, as is currently proposed. "It's like asking a cat to guard a bowl of milk," said Gidon Bromberg, the Israel director of Friends of the Earth Middle East. Bromberg and other critics of the canal plan charge that the Israeli, Jordanian and P.A. governments are interested in the canal solution because the international community might foot the bill for it as a massive desalinization or peace project. Alex McPhail, the program manager at the World Bank who is overseeing the overall study of the project, says the bank is being methodical and scientific in its approach. He noted that the World Bank’s approach consists of three parts: a feasibility study, an environmental impact study and a report on alternative solutions. Proponents of the canal project argue that the project could be a one-stop solution for replenishing the waters of the Dead Sea, generating energy, and providing drinking and agricultural water for Jordan, Israel and the Palestinians. The project also is being touted as a rare symbol of regional cooperation. "There is an interest internationally in saving the Dead Sea and this could also help bring water to the region that badly needs it," said Uri Schor, a spokesman for the Israeli Water Authority. “We need to check all the options. If the project is deemed unsuitable, then we won't do it. But if there are no problems found, then why shouldn't we pursue it?" Some developers see the project dubbed the Red-Dead Canal as a potential boon. Isaac Tshuva, the Israeli real estate magnate, has answered President Shimon Peres' vision for a so-called Peace Valley to be built along the canal -- a corridor of shimmering skyscrapers, casinos, man-made lakes and 200,000 hotel rooms. That’s more hotels rooms than currently exist in all of Israel. The vision is for a new tourist and industrial mecca that planners hope would draw as many as 3 million Israelis to live in the region. The project, whose scale would be unprecedented in Israel, has been described as Las Vegas meets Dubai in the Arava Desert. Its detractors roundly condemn it as an environmental nightmare. In 2007, when Peres was Israel’s minister in charge of Negev and Galilee development, a government decision declared the Peace Valley project and the canal as national projects. At the time, some environmentalists warned that political and business interests were being mixed too closely at the potential expense of the environment. Baruch Spiegel, Peres' adviser for regional affairs, rejects any such notions. The government made its decision to prioritize the project because of Israel’s water crisis and the shrinking of the Dead Sea, he told JTA. The Dead Sea’s water levels are dropping by about 3.2 to 3.5 feet per year. "This is a major vision of the president of Israel -- to use water and energy as a catalyst for peace and stability," Spiegel said, emphasizing that environmental concerns will come first and any development that follows will have to adhere to strict guidelines. "All options are being examined very carefully," he said. "But without a project, things will get worse." Some Israeli and Arab environmentalists say the Jordan River, historically the main source for the Dead Sea's water, should be rehabilitated rather than undertaking such a complex and expensive project as the canal. They also suggest reforms in the chemical industries on both sides of the sea, which are blamed for contributing to the Dead Sea's dwindling water levels. Among the environmentalists’ main concerns is that mixing Dead Sea and Red Sea water could damage the Dead Sea's unique ecosystem, leading to growth of algae that could change the color and buoyancy of the water. That would also damage the tourism industry that has sprung up around the Dead Sea in both Israel and Jordan. Others note that if the salty marine water from a canal or pipeline were to leak, it could seep into the ground water and contaminate local aquifers. There are also concerns that the coral reefs of the Red Sea could be harmed by the pumping out of so much of its water. For Gundi Shahal, a member of Kibbutz Ein Gedi, which sits near the banks of the Dead Sea, the questions about the canal plan are not just academic. "Who will take responsibility for the impact on our lives, livelihoods and what we call home?" she asked at last week’s hearing.